What’s on in food this week? An annual festival dedicated to the humble oyster, a rosé soaked brunch and plenty of Christmas festivities! Mixing pop up food trucks and stalls with music and a dash of traditional Christmas festivities and decorations, the Eats & Beats Christmas market village, plenty of Christmas carols, and a special visit from Santa Claus will all get you in the mood for the most joyful time of year. The star on the top of the tree is that entry is completely free! So, go on, give yourself an early Christmas present and head down to the Eats & Beats Christmas Festival. Check out their Facebook page here to stay up to date with all the festivities. It doesn’t get any fresher than this! Take a tour of local farm Not.Waste before tasting the results at the Merriweather Cafe. After a trip to the farm, Merriweather’s head chef Jarrod Huey will host conversations over the evening meal as you learn the benefits of fresh food production with minimal wastage. Over the meal, you’ll have a chance to ask Jarrod and Not.Waste’s farmers some informal questions about their food philosophy. Of course, the highlight of the night will be tasting the benefits of their innovative work – so come with an appetite! Tickets can be purchased here. Breakfast is the most important meal of the day, and it’s also by far our favourite, which is why we’re so excited about Little Clive’s Breakfast for Dinner night. No, we’re not talking about cereal at 7pm, this is all about your favourite morning classics with an evening twist, paired with mimosas and Bloody Marys. There’ll be more details closer to the date, so keep updated here. Make sure you book your seat by calling (07) 3162 0260. Brisbane is overflowing with decadent brunch options at the moment and Jellyfish just launched a true contender for our boozy hearts! Every Sunday of this month, Jellyfish is throwing a communal Sunday brunch complete with free flowing rosé. Feast on a European style brunch where you’ll be treated to a delicious Mediterranean menu designed by head chef Sean Calliste, including whole baked fish, char grilled spatchcock and baby squid. The menu rotates every week so don’t be afraid to double dip! And did we mention the rosé? If you’re not sipping bottomless mimosas with your brunch on a Sunday morning, then frankly, you’re just not doing Sundays right. Lucky for you, Cloudland are inviting one and all to join their new Brunch Club – and there’s plenty of bubbles involved! $75pp will score you 3 and a half hours of food and booze! We can’t think of a better way to spend a Sunday than at this glam bar, complete with live entertainment and a pan-Asian inspired brunch menu. Grab a fellow brunch lover and email hello@cloudland.tv or call 3852 5000 to book a spot. 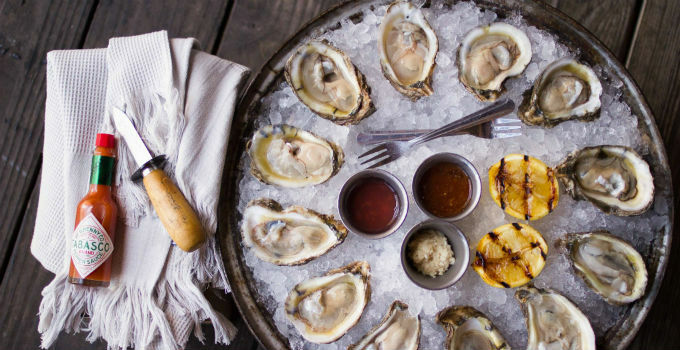 The fourth annual Oyster Festival will be dishing up half and full dozen specials and fresh seafood platters to share with mates, along with 1 keg of Oyster Stout, the perfect accompaniment to freshly shucked oysters. The world is your oyster, so don’t stop at shellfish – Phunky Dory Food Truck will also be around from 4:30pm, dishing up fresh Australian fish and chips, calamari and salt and pepper prawns. The popular Valley bar, Sabotage Social, have brought together Holgate Brewhouse and The Smoke BBQ for a Sunday filled with meat, beer and music. Taste some of the best beers around from the Victorian-based Holgate Brewhouse while The Smoke BBQ will be plating up some of their most delicious meats on the day. There will also be plenty of music with The Gutterbirds playing their hilarious and awesome mash up covers of Soho, Jay Z, Snoop & more. Check out their Facebook page here to stay up to date on all the juicy details. Every month, By the River – Jazz & Food Trucks sets up in one of Brisbane’s best kept secret heritage locations, Newstead House Brisbane, for a day of sunshine, smooth jazz, Newstead Brewing Co. Beers and scrumptious eats from 10 of the best food trucks in town. With twilight river views, this evening outing is perfect as a family Saturday, a way to chill out before the working week, or to recover from the one too many margaritas you had the night before. It all kicks off at 4pm, just in time for those sunset river views.